I've had these brushes for a little over three weeks now, testing them and what not, so I feel like it's time to give them a proper, thorough review! And just to get it out of the way, I purchased these brushes on my own. 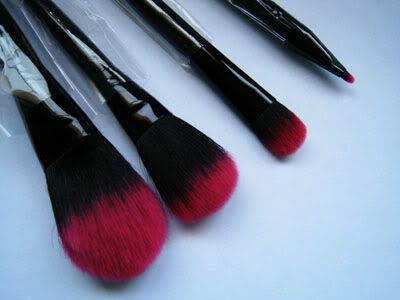 For months now, Bubz of Bubzbeauty & makeup guru on YouTube has been talking about releasing her own line of brushes, and that she had lots of influence in the design process, from the brushes themselves, and what materials they were made of. 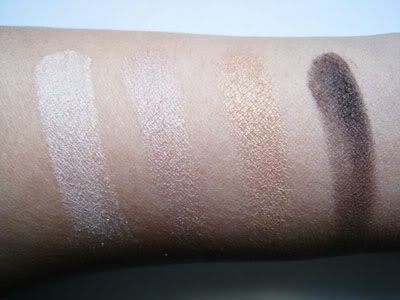 I was excited for the release of the brushes (if you can't tell already, I get just a tad excited when it comes to makeup brushes..), but honestly, a little skeptical. When things get hyped up, I almost always expect too much, and end up being disappointed. It's rare that something actually lives up to my expectations when it's praised and talked about so often. So the day came for the brush release, and I was a little hesitant to order them. 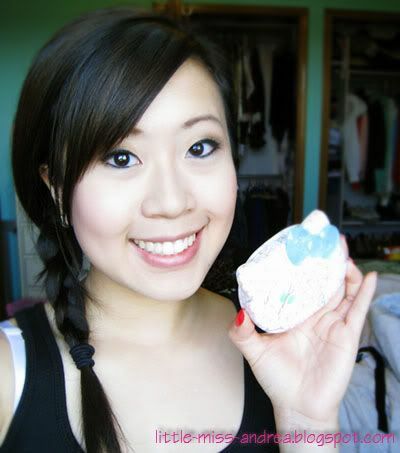 I ended up doing so anyway, and a couple days later, a cute little package made it to my house. I only ordered three brushes from the collection, mostly the ones that I find myself using a lot - my powder & kabuki brushes. 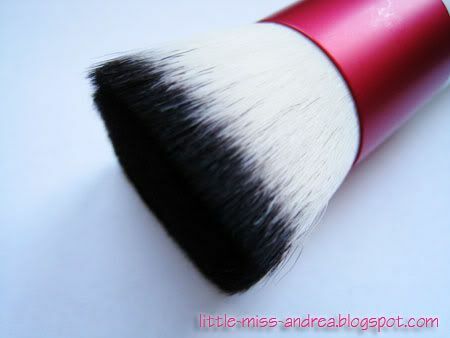 I chose the buffer brush, powder brush, and kabuki brush. 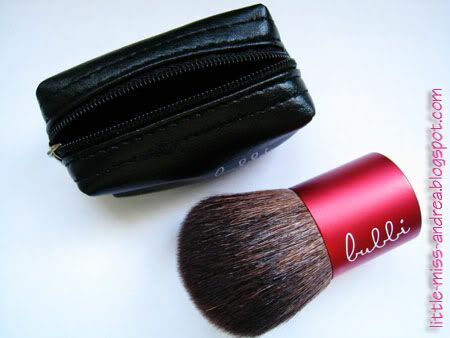 The buffer brush is designed to work with powders, whether foundation, blush or bronzer. The brush itself has a flat top, which works very well to pick up pigment and lots of product with a brief swipe. 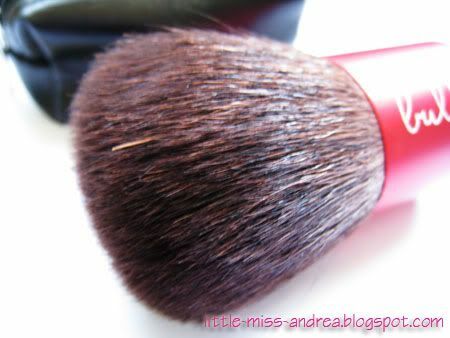 As you can see, the brush hairs are packed and very dense on this brush, but the synthetic bristles are SO soft. They are flexible, but durable, and the way they taper outwards allows for reaching smaller spots around the nose area. As it is meant to be a buffer, it makes your product work better and blend into skin seamlessly, giving my face even and fantastic coverage. The powder brush on the other hand, features longer synthetic bristles that are flexible, yet sturdy, to allow for proper control during application. Due to the longer length, it is not as rigid as the buffer brush, and much more flexible, giving it the ability to work over larger areas with one sweeping motion. 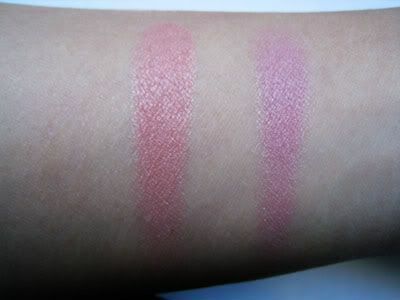 Because the bristles are spread further apart, it does not force the product to work into the skin as nicely as the buffer brush, giving a lower amount of coverage. 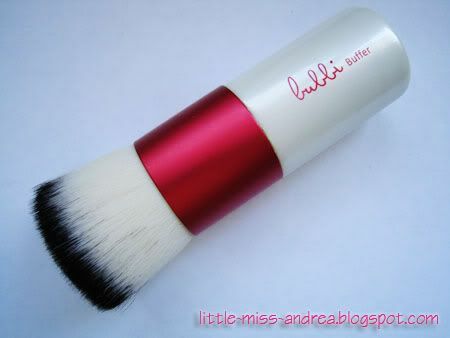 However, this is probably one of the softest brushes I have ever felt on my face, and I love just feeling it sweep across my cheeks! The handle is easy to hold for good control - there isn't anything really bad about it! Bubz has said it can be used for blush, but I find that the brush covers too much of an area, putting the blush in places I didn't intend for it to go. 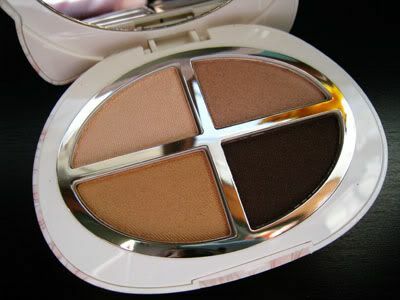 In my opinion, it's best for setting powders. 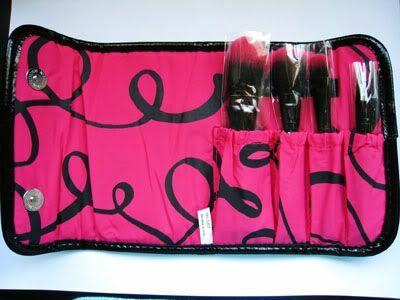 Last up is the kabuki brush, which features its own zip up carrying case for travel. Unlike the other two I picked up, the kabuki is made of goat hair, so it feels a little rougher than the synthetic bristles. They are, however, still quite soft. The hairs form a nice dome shape, allowing the brush to get to smaller areas, and those that are hard to reach with bigger brushes. 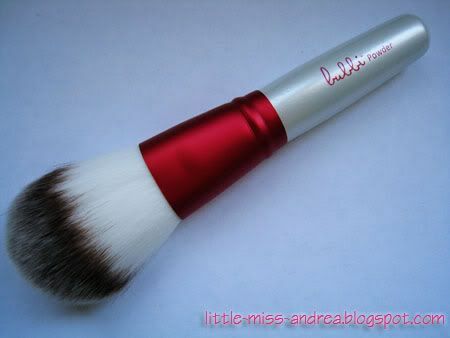 The bristles are dense like the buffer brush, giving a higher amount of coverage for a flawless, even finish. 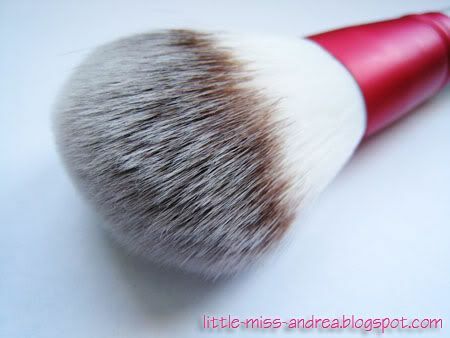 This brush works well with blush as well, but be cautious as the bristles pick up quite a bit of pigment! I have experienced no fallout with these brushes so far, which is amazing! I hate when I get bristles left over on my face. The brushes were hyped up for good reason, and did nothing less but impress me. Although I haven't bought the other brushes, I wouldn't hesitate to pick them up based on the performance of these three - thank you so much for making amazing brushes Bubz!! The price for all three brushes including shipping to me was approximately $60 CAD - not a bad price for wonderful brushes! Here is a link to the video Bubz made about all her brushes. Enjoy! One of the articles of clothing I consider to be essential in a wardrobe is a nice leather jacket. 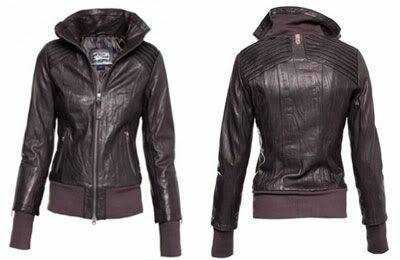 Leather jackets are perfect for the spring and fall, and any gloomy days that fall inbetween. Leather jackets come in different materials and cuts, and I've actually gone through quite a few myself before finding the perfect one. Whether faux leather, or genuine leather, all the pieces fall at different price points, so you really have to look around and compare what different stores have to offer. I generally like my jacket to be a bit snug, as over time, the leather will stretch out and the jacket can go up half a size or so. The one I've fallen in love with is the Lauren by Mackage. And let me tell you, the leather on this jacket is suuuuuper soft. I'm always worried about scratching it! The jacket fits very snugly, so that I'm able to wear it with the zipper open and not have it look like it's big on me. But what I love about it most is the little details. The zipper along the sleeve allows me to style it, and the sleeve is actually able to be rolled down for the days where it's colder and I want to cover my hands. 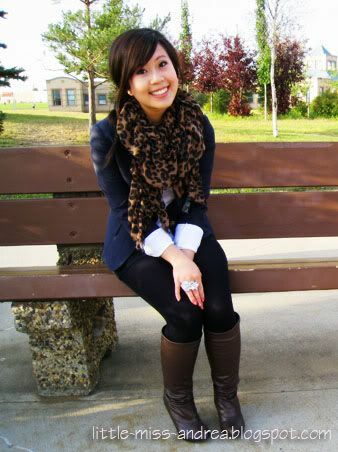 The paneling detail in the back elongates the body, and the high collar can help me stay warm on those windy days. A week ago, I went out for breakfast with my mom before heading off to class. The sun was shining bright, but the winds were strong outside. It seemed to be a nice day to go out.. except it was FREEZING. Don't you hate when the weather deceives you? I wanted to go somewhere near campus, just to make sure I would be on time for school. Upon countless recommendations from friends, I decided to hit up the Sugarbowl - surprised that I haven't been here before? 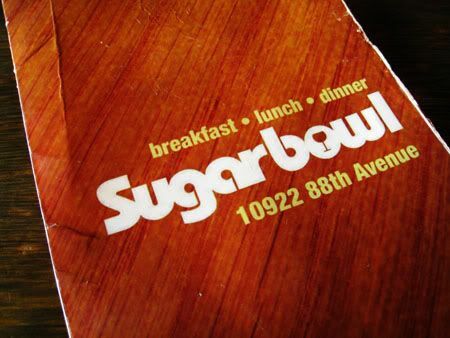 The Sugarbowl looks like a cute little place to enjoy meals, with a patio outdoors, and many small tables indoors to accommodate the crowds. The inside reminds me of an old style restaurant - all the tables are wooden, and decorated with only the essentials: salt, pepper, and sugars for your coffee. 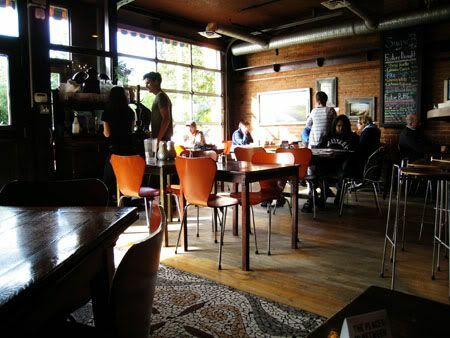 Daily specials are written up on a blackboard, and the vibe of the restaurant was laid back and relaxed. What I was surprised about though, was the huge variety of beers and wines they have available - the list took up 2/3 of their menu! 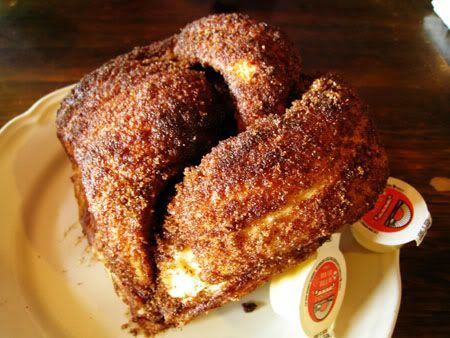 For breakfast, my mom ordered the famous cinnamon bun - everyone that I talk to about the Sugarbowl raves about this thing! Unlike others found around the city, this particular cinnamon bun ($3.50) is MASSIVE, and isn't served with icing on top. Instead, the top is covered in a light syrup & brown sugar, and served up with butter on the side. I thought that the bun might turn out to be a little dry, since it didn't really look sticky or all that moist, but I was proven wrong! The cinnamon bun itself has a slight crunch to it on the outside due to the sugar, but the inside is oh so soft. It is just the perfect amount of sweetness, but due to the size, I'd say two people are required to eat the whole thing. Do try it if you have the chance! For my breakfast, I ordered the Sugarbowl Benny ($12): Poached egg w/ back bacon on cornbread topped with thyme béchamel sauce & potatoes. 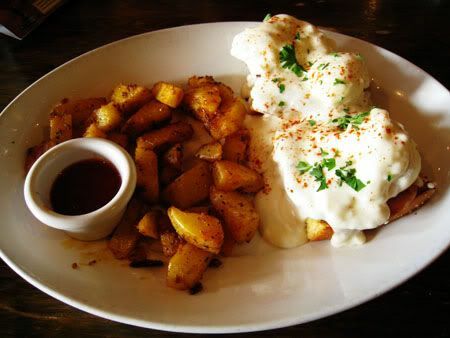 When I go out for breakfast, I often order eggs benedict as I'm way too lazy to cook them up myself at home. It's hard to get it just right, and the cooks at the Sugarbowl failed to impress me with theirs. My eggs were way overcooked. The yolk was solid, and the whites were so chewy and rubbery that I had to leave them on the side. The béchamel sauce had a great consistency, but it just doesn't live up to the hollandaise sauce I prefer. Because the eggs were topped on cornbread, the sweetness was overwhelming for me, and the back bacon didn't balance it out. In other words, I feel that the flavours of each portion didn't work well together. The potatoes on the other hand, were flavoured very well, and borderline salty - but I liked them. When eaten in combination with the eggs, the dish tasted fine - but I'm not sure if it was meant to be eaten together. Although breakfast wasn't fantastic, I'm curious to see how their lunch is. They have great lunch specials served with soup/salad for $10, which is very affordable if you ask me. Once I check it out, I'll be sure to let you know! Ever thought of your fingers as "stems"? 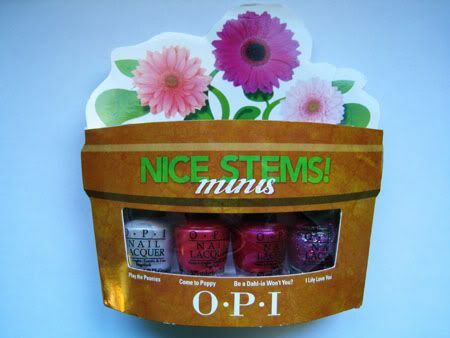 I never have, but when I came across the OPI Nice Stems! collection, it kinda made sense to me. 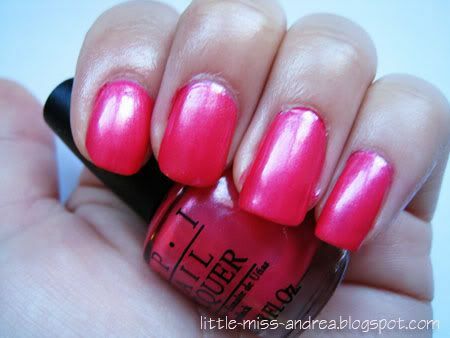 With my fingers as stems, and my nails as the beautifully coloured flower petals, I could deal with that. As long as my skin doesn't have to be stained green, of course..
Later on in the week I was pretty tired of hitting the books (something I really shouldn't be considering the semester started last week..! 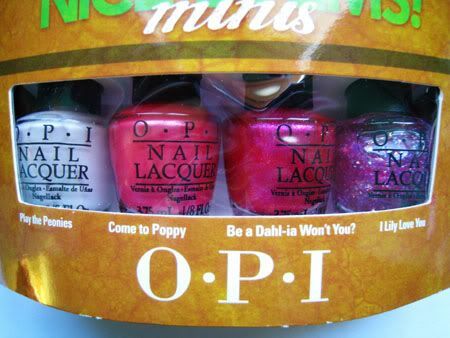 ), so I played around with a gold gradient on top of Come to Poppy. 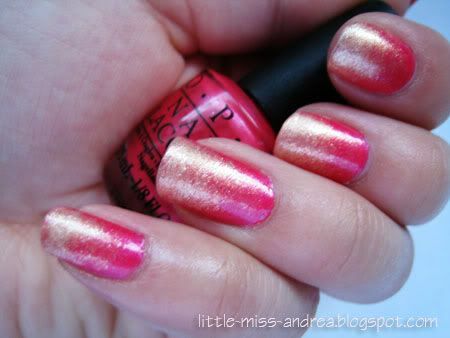 The gold is Gold Get 'Em by Revlon. ... 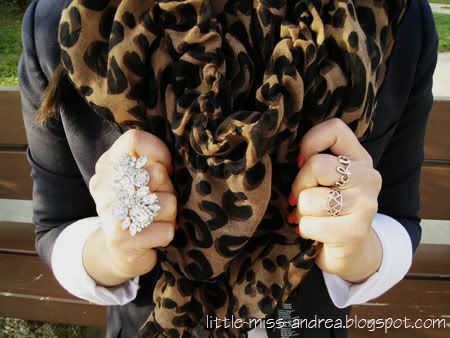 I have become obsessed with animal print. I must have more, more, and more. Just wanted to say a couple quick words about this cute little brush set I picked up at Sephora lately! 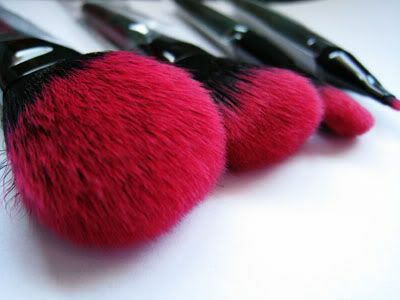 Whenever I go on my travel adventures, it can sometimes be a pain when I have to clean my brushes, and put them into my makeup bag. Although I use brush guards to protect the brushes, there is the possibility of them shifting around and having the bristles bent! It's a mess sometimes. 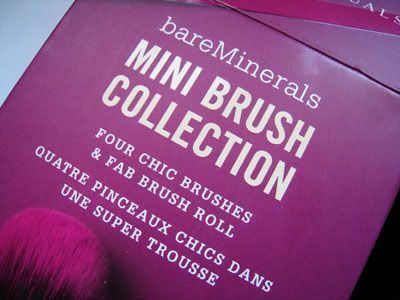 With my last Sephora order I picked up the Bare Escentuals Jet Set Mini Brush Collection, which comes with 4 mini brushes and a brush roll that can be used to tote them around. The case itself is relatively sturdy, but I know someday it's bound to fall apart. 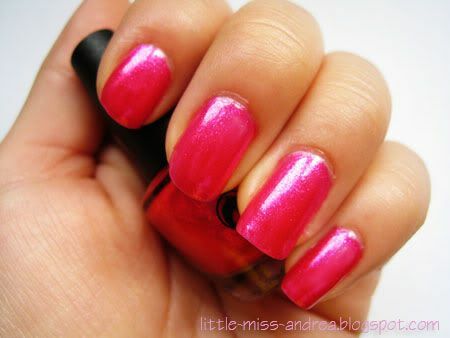 I love the hot pink lining on the inside though! It's such a beautiful contrast to the black. Only thing I don't like is that it smells like cheap plastic.. with time I do hope that goes away. 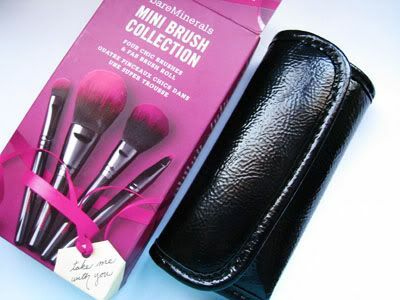 But the case isn't what I bought this set for - it's for the brushes. 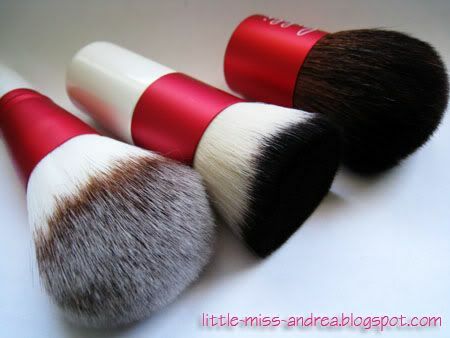 The bristles on each brush are super soft and fluffy, the way I like my makeup brushes. There's nothing that irritates me more than bristles that are course and make my skin itchy. Like really? Things like that should never be allowed to leave the manufacturer's factory. 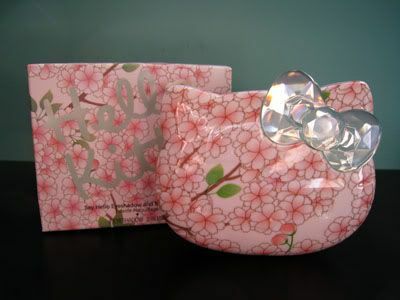 The set comes with a line diffuser brush (4"), blush brush (4.5"), shadow brush (4.5") and a face brush (4"), all of which are easy to maneuver and pick up a good amount of product. 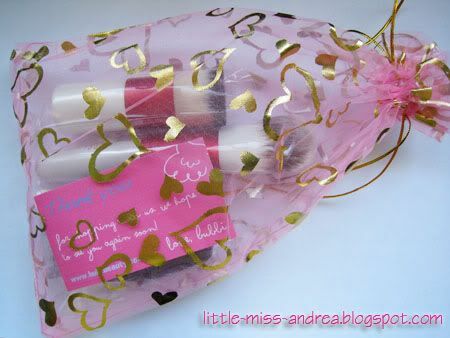 Each handle is stamped with the brush name, and the company name in the same shade of hot pink as featured at the brush tip and inside the brush roll. I love this! While the heat wave continued on last week, Lisa and I hit up Whyte Ave for lunch while we still had the chance - beautiful weather and no assignments! Phew. This week on the other hand... don't even get me started. 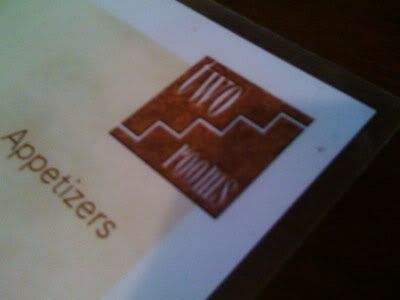 Two Rooms Cafe is a quaint little restaurant - and in a location tucked away if you ask me. The many times I have shopped along this avenue throughout my life, I honestly never knew that such a cafe existed, let alone a space like it. It hosts a patio outdoors in the summer, in which the umbrellas tend to hide it's sign posted against a small space on the wall. Perhaps it's easier to find in the Winter? 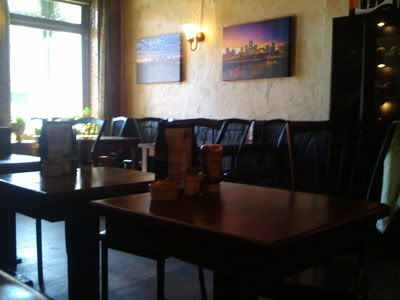 The lighting inside the restaurant isn't fantastic - we were lucky the rays of sun from outside brightened up the space. The walls are lined with artist paintings of the Edmonton skyline - they actually made me appreciate the beauty of our city & the river valley. The way the menu is presented makes this restaurant seem catered to vegetarians. 90% of the items are without meat, but I'm sure there is the option of adding your favourite protein in there for an additional cost. 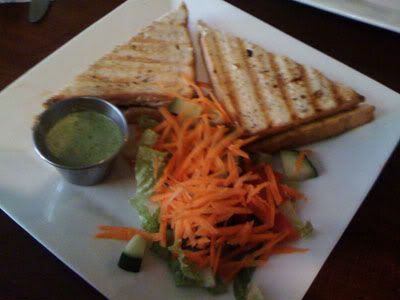 All the choices on the lunch menu were served with a side of soup or salad, and ranged from $9-$14. 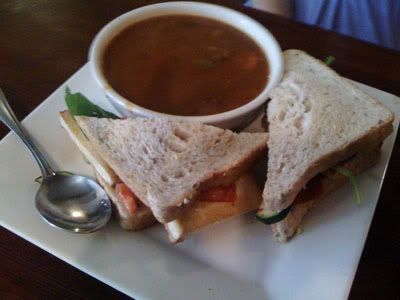 Lisa ordered the tofu sandwich ($11), consisting of lightly fried tofu, tomatoes, zucchini, greens & spinach, and the soup of the day (curry on the side). As for myself I got the portobello, roasted pepper & feta panini on multigrain ($13)- so delicious! The sandwich also contained an avocado spread, reminiscent of guacamole, and caramelized onions. Altogether it was such an amazing combination, all warm and gooey with the melted cheese. The salad I could care less for - romaine lettuce, diced tomato & cucumber, and shredded carrots with dressing. The soup is a better value! It's been ten years since 9/11. I still remember that day, I woke up not knowing what had happened, and my sixth grade teacher at school informed us of the tragedy that took place. I went home for lunch that day, and the CNN news reports were playing in my living room. I stared at the screen, not understanding why something like this had to happen. It seriously blew my mind. Life has changed dramatically since that fateful day - and each year, we take time to remember the countless lives lost. Those innocent people that lost family members, the innocent people that didn't deserve to die. No one deserves to experience anything like that. In memory of the fallen heroes that risked their lives, in memory of those who didn't deserve to die. To those who to this day are still affected by the aftermath of 9/11. New Remix of Heaven by DJ Sammy & Yanou, featuring a girl who lost her father to 9/11, meant to be heard on this day. I hope you take the time to listen to this. It's Fashion's Night Out tonight in cities across the world, and I'm so jealous to be stuck here in Edmonton! Boohoo. Nothing new & exciting ever happens here haha! 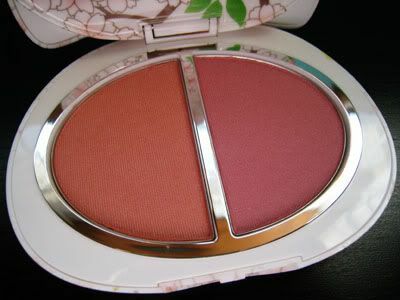 So as a pick me up and to celebrate the world of fashion & style, I'll share with you my new fall beauty! I'm a seasonal bag type of girl. 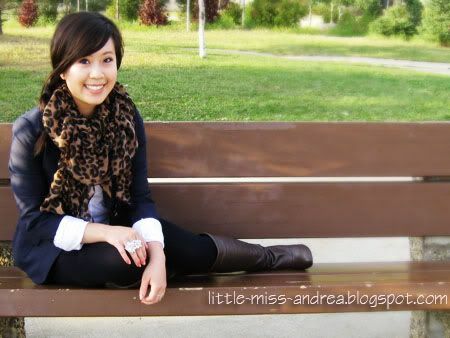 A girl that loves to change things up when the weather changes and the seasons come & go. Of course, I do love my staple bags that I can use all year round, but I also give my bags labels, and use them in certain instances, or during specific times throughout the year. This little beauty that I ordered a couple weeks ago? She's perfect for the fall, but I just might be tempted to flaunt her all year round. 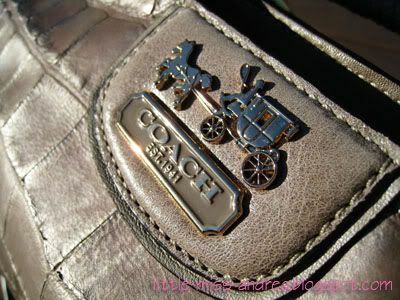 The latest bag I've picked up is from none other than Coach. I often hear things along the lines of the following phrase: "hah, Coach? They're poor quality and cheap cause they're made in China". I don't think that the bags are poor quality, nor cheap. 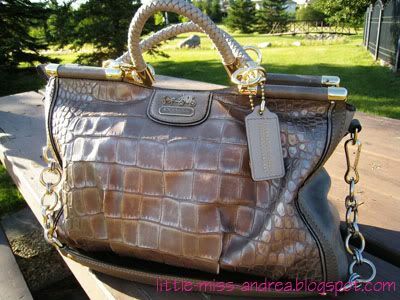 As an affordable luxury brand, I commend their ability to make a bag for any woman or man out there - there is so much variety that any one bag is bound to tickle your fancy. 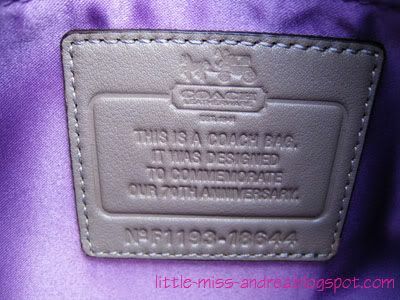 I've always been a fan of Coach and their innovative design team. They source high quality Italian leathers and other materials to craft their bags, which, by the way, are handmade. Every time I walk into a store, I know that there is a bag for everyone. Anyway, enough about my rambling. My admiration for this company has been put out there and I stand behind my own opinions & beliefs. Introducing my new Caroline! There's little snippets for you to piece together before seeing the whole thing! 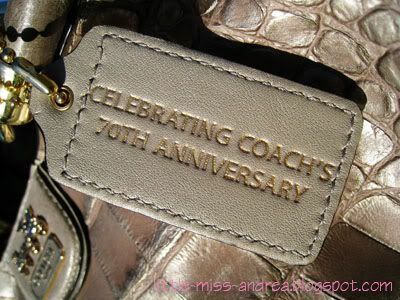 This particular bag is a limited edition bag, designed to commemorate Coach's 70th Anniversary. This particular bag, along with other Caroline styles will be available in Flagship stores this upcoming October, given that there are any left! When I received this baby, there were only 20 left. Yikes! 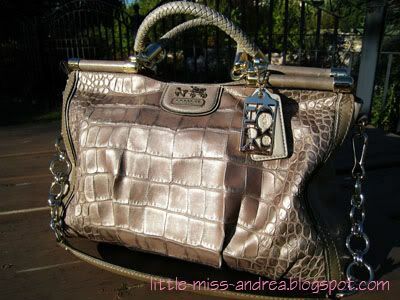 There's so much texture to the leather on this bag, and the different pieces that put it together make it a showstopper. 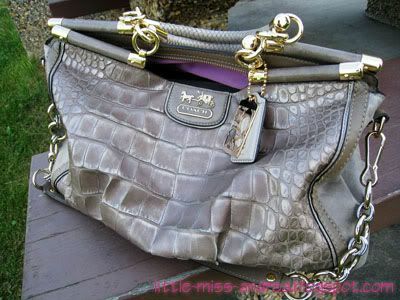 The bag is all cow leather (no crocodiles harmed in making this bag! 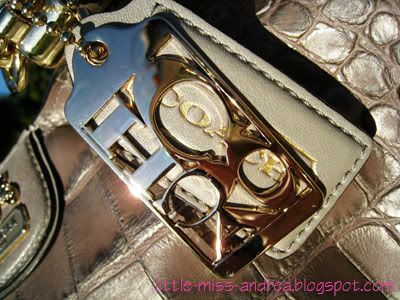 ), where the pattern is stamped on, giving it's name - croc embossed leather. The particular colour is called light pewter, and has a metallic finish to it, giving it a slight sheen. 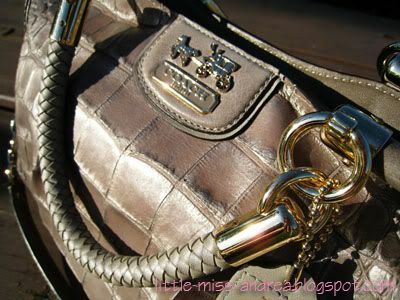 Personally, I would say the leather is taupe coloured, with a light pewter metallic finish. Despite being petite, I love to carry my big bags. This one is no exception, with measurements of 15" x 11" x 6" - you can carry everything! The lining is also a beautiful lilac purple which compliments the pewter accents beautifully. When empty, the bag does not maintain it's shape fully, but it holds up rather nicely. My favourite things about the bag are the attention to small details - the braided leather handles, 14K gold hardware, commemorative hang tag, pleated detailing, and of course the amazingly soft leather used to create this bag. Can't wait to wear her out with different outfits! If you're interested at all, this bag is available for order right now, retailing $1000.